The term headache refers to a number of different presentations of discomfort or pain in the head. Headaches may be unilateral (one sided) or bilateral (both sides). The duration and onset may be intermittent, episodic or constant. There are acute types of headaches which come on suddenly and often eases just as rapidly. Other headaces may develop gradually. Chronic headaches may occur for weeks or even longer and usually return at the same spot. The frequency of headaches also determine whether it is an acute or chronic headache. For example, headaches that occur for a few hours daily and recur every day or every few days may still be considered as a chronic headache. On the other hand, there can also be a constant headache which may ebb at times but does not stop. This is also a chronic headache. Sometimes concomitant symptoms like nausea, vomiting, nasal congestion, watery eyes, eye pain, dizziness and even jaw or ear pain may be present with the pain. The other symptoms can be helpful in identifying a possible cause. For example a headache with eye pain could be linked to eye strain or certain eye diseases. Similarly a headache with dizziness may be related to certain conditions affecting the or surrounding tissue like meningitis. Most of us tend to describe our headache by the location and nature of the pain. This can also be helpful features in identifying a cause. For example a headache at the back of the head is common with neck stiffness after long term computer use. These computer-related headaches may also be due to eyestrain. However, there may be atypical situations where pain in one part of the head may be due to factors that are not localized. The terms for different anatomical positions can be confusing. A simple way to identify the location of the headache is to look at the position in relation to the parts of the skull, particularly the cranium. This is a rather simplistic approach which may at times be misleading. For example, the area behind the ear still falls in the temporal region and not occipital. Whereas some may argue that the upper parts of the back of the head is the occipital region, it may actually be the parietal region. However, a basic understanding of the anatomical terms when discussing the location of pain is helpful. For example, a frontal headache means head pain at the front of the head by the forehead. In some cases the exact location of the pain cannot be identified. Patients will report that the pain is “everywhere” or on the “entire head”. This is known as a generalized headache. 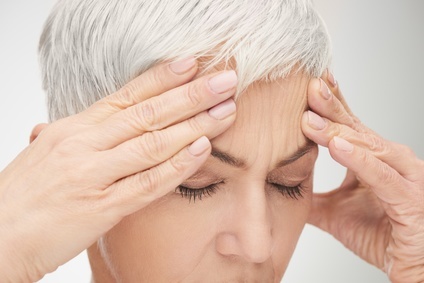 This term can sometimes be used for headaches where patients describe a halo type of headache around the head or a band running around the head. Another complaint is that the headache involves the entire head with certain parts being worse than others. This too can be considered as a generalized headache although the area with the most intense pain may provide a better indication of the cause. Determining the type of headache depends on multiple factors apart from the location. The guide below is intended to indicate the most common location of pain in the different types of headaches and is not a diagnostic guide. Pain radiates from back (occipital) to front (frontal). Duller pain on parietal region with pressure on the vertex. Pain like a band around the head. May be accompanied by neck pain or stiffness. Typically involves pain around or behind the eye on the affected side. May be be accompanied by pain at the bridge of the nose, or on the affected side of the nose. Pain tends to affect one half of the head (unilateral) but can occur on both sides (bilateral). Location may vary but often occurs on the frontotemporal region (frontal + temporal or front + side). Pain can occur anywhere and even the location may change during attacks. Tends to occur on the temporal (sides) or parietal (top) regions. Pain may affect one half of the head. Tends to be more prominent on the temples (temporal) and around the eye (periorbital). Pain typically around the eyes (periorbital). Pain tends to occur at the back of the head (occipital), on top of the head (parietal) or is generalized. This type of headache where the pain is on the top of the head involves the parietal area and sometimes the frontal area as well. 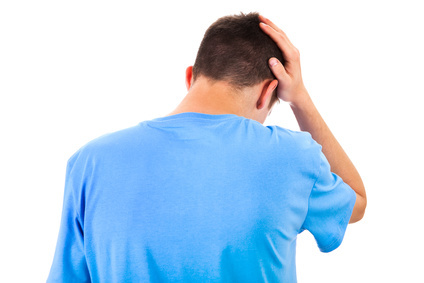 A headache with pain at the back of the head involves the occipital region but the neck and spine may also be involved. Also refer to headache at the back of the head. A headache where the pain is at the sides of the head involves the temporal regions of the skull. It can also involve the surrounding sphenoid, frontal and parietal regions. A headache where there is pain at the front of the head usually involves the frontal region but may also involve the nasal bone. Often it is described as forehead pain. 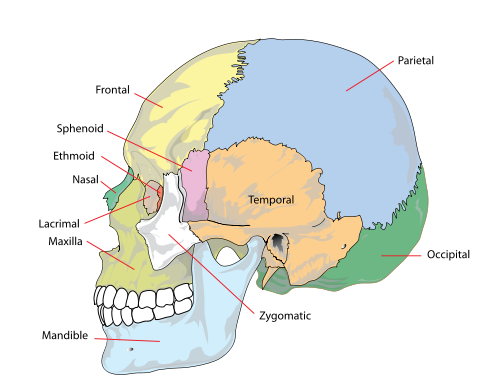 A headache where there is pain behind or around the eyes may involve the frontal bone, lacrimal bone, ethmoid bone, zygomatic bone, maxillary bone, palatine bone or sphenoid bone as these bones form the orbit. Refer to headache behind the eye.